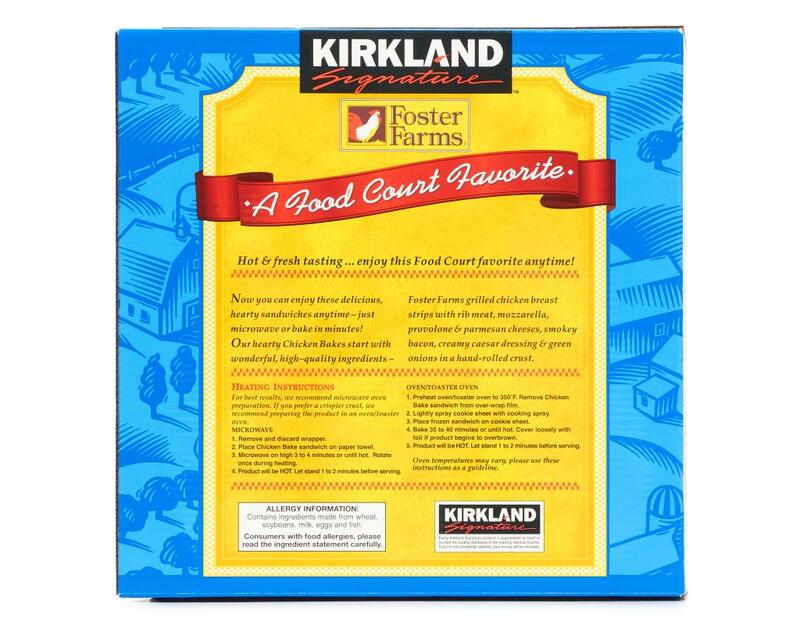 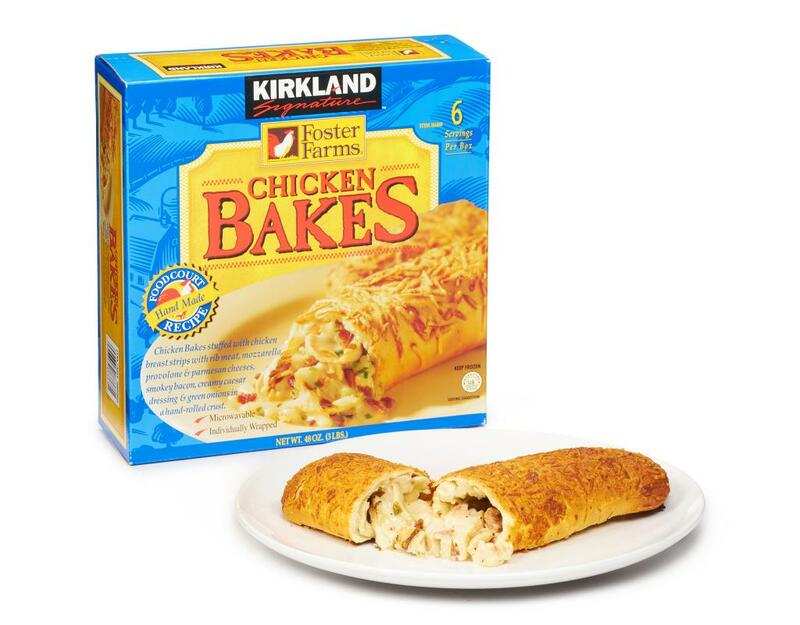 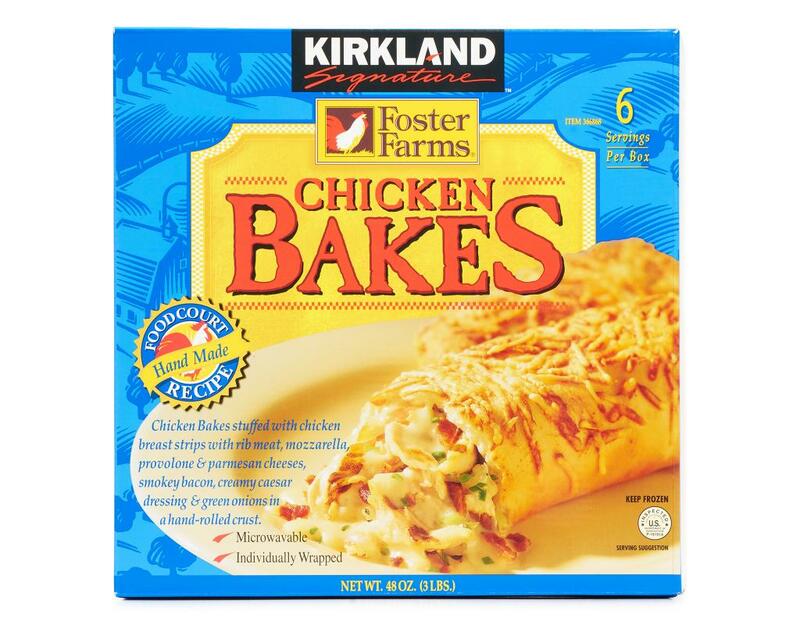 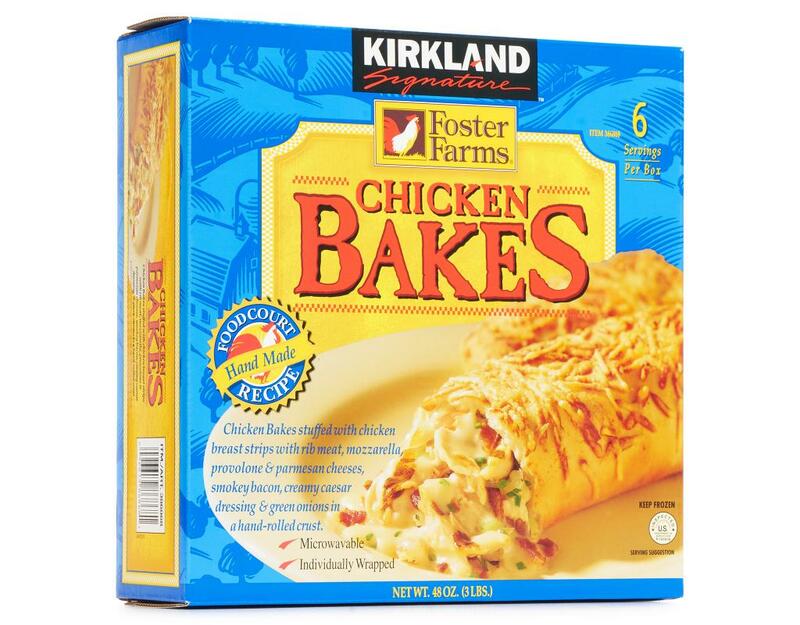 Kirkland's iconic food court Chicken Bake. Stuffed with chicken breast strips, cheeses, smokey bacon, creamy dressing and green onions in a hand-rolled crust. 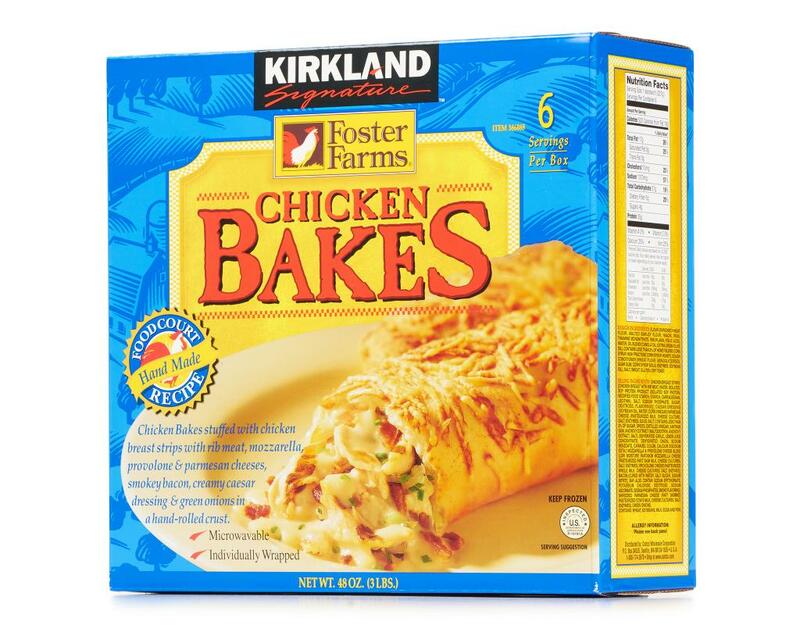 And now, save a trip, enjoy this favorite at home! Dough: flour (enriched wheat flour, malted barley flour, niacin, iron, thiamine mononitrate, riboflavin, folic acid), water, oil blend (canola oil, extra virgin olive oil). 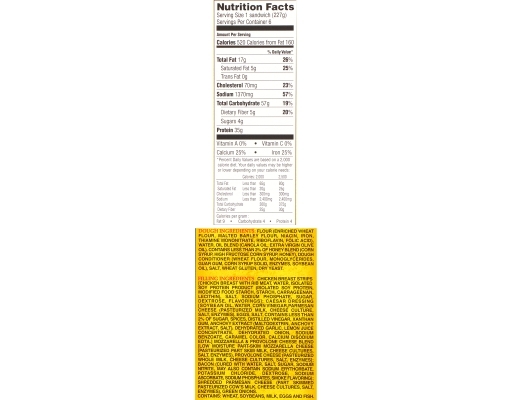 Contains less than 2% of honey blend (corn syrup, high fructose corn syrup, honey), dough conditioner (wheat flour, monoglycerides, guar gum, corn syrup solid, enzymes, soybean oil), salt, wheat gluten, dry yeast. 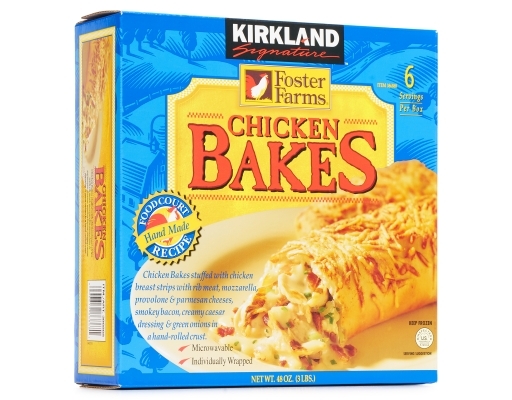 Filling: Chicken breast strips [chicken breast with rib meat, water, isolated soy protein product (isolated soy protein, modified food starch, starch, carrageenan, lecithin), salt, sodium phosphate, sugar, dextrose, flavorings]; caesar dressing [soybean oil, water, corn vinegar, parmesan cheese (pasteurized milk, cheese culture, salt, enzymes), eggs, salt, contains less than 2% of sugar, spices, distilled vinegar, xanthan gum, anchovy extract (maltodextrin, anchovy extract, salt), dehydrated garlic, lemon juice concentrate, dehydrated oinion, sodium benzoate, caramel color, calcium disodium edta.] mozzarella & provolone cheese blend [low moisture part-skim mozzarella cheese (pasteurized part skim milk, cheese cultures, salt enzymes), provolone cheese (pasteurized whole milk, cheese cultures, salt, enzymes]; bacon (cured with water, salt, sugar sodium nitrite, may also contain sodium erythorbate, potassium chloride, dextrose, sodium ascorbate, sodium phosphates, smoke flavoring); shredded parmesan cheese (part skimmed pasteurized cow's milk, cheese cultures, salt, enzymes), green onions. 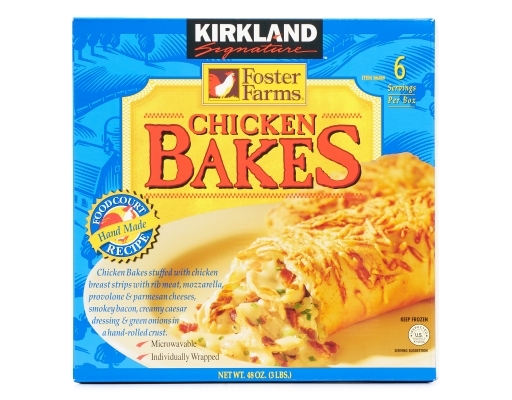 Contains: wheat, soybeans, milk, eggs and fish.